This is a Sunshine Coast BC directory of Gibsons excavating contractors & services. All located in the town of Gibsons BC. Titan Excavating specializes in the installation of concrete driveways. From site preparation & drainage to beautiful finished driveways that add street appeal and value to your home or business. Rubber tracks, full size machines and trucking available for all types of excavating requirements. No job too big or small. 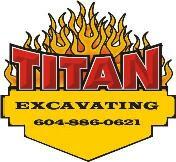 Titan Excavating Call 604-886-0621 to discuss your excavating needs today! Azimuth Excavating - Visit Our Website! Call 604-885-7487 and talk to Ken Birkin about your excavating needs. NB Contracting is a full service excavation and trucking enterprise. Utility instalation, watermain work, site preparation and clearing, and road building are a few of the things NB Contracting can do for you! NB Contracting - Call 604-885-8405 for an estimate.